The England-born prop earned his first Ireland A call up in 2006/07 and for a while his rugby was restricted to playing for Ulster in the Celtic league and Heineken Cup. 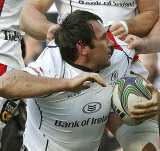 However he returned to the Ireland set-up when he was included in the squad to face the Barbarians in May 2012. He had previously missed much of the 2011/12 season, but returned to the side and came off the bench when Ulster lost the Heineken Cup final to Leinster at Twickenham. His form at the start of the 2012/13 was good enough to help him win a call-up to the Ireland squad for the autumn internationals.